Making ends meet on a limited income takes commitment, organization, and planning. 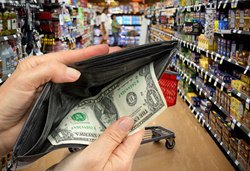 It’s not uncommon for consumers to have a hard time making ends meet on a tight budget. In some cases, the income they are earning each month is not enough to cover necessities, let alone luxuries. Living on a tight budget is not impossible if consumers learn how to manage their money properly. National nonprofit American Consumer Credit Counseling (ACCC) explains how consumers can live a healthy financial life on a limited budget. According to a recent survey by CareerBuilder, 78 percent of Americans live paycheck to paycheck, up from 75 percent in 2016. The survey also found that 71 percent of American workers say they are in debt. Out of the respondents with debt, 46 percent say their debt is manageable while 56 percent admit they will always be in debt. When it comes to savings, 26 percent don’t have enough extra money to set aside for savings each month. 1. Budget – Create a budget that lists all your monthly expenses. This includes bills and debt, as well as normal monthly expenses, such as food, clothing, and household items. 2. Assess monthly expenses – Break down all monthly expenses into needs and wants, and see where you can cut back. 3. Cut back on spending – To reduce expenses, take a look at your ‘wants.’ Look at cutting back on expenses, such as cable, vacations, and dining out. 4. Become a planner – Plan your weekly meals in advance so you don’t cave and eat out most nights. Making a shopping list for the ingredients you need will also prevent you from purchasing food that will go to waste. 5. Don’t rely on credit – Using credit cards wisely helps improve your credit score, but if you don’t have the cash to pay the bill, then you might get stuck raking up unnecessary debt. 6. Live within your means – Friends and family can be the biggest influencers in our spending decisions. Learn to say no if you can’t afford the activity or material things all your friends seem to have. 7. Look for deals – Whether you’re in the market for a needed item or want to take a vacation, there are deals out there, especially if you know where to look. Take the time to research coupons and sites that offer discounts for those items or experiences you’re hoping to afford this year.